This summer, Pippin Hill Farm & Vineyards hosted the first event/workshop in what is tentatively a new agritourism series. 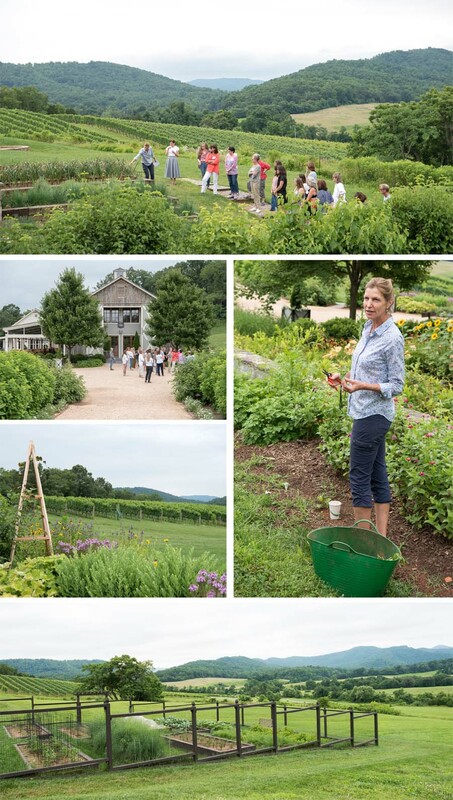 The “Cut Flower Workshop” was led by the vineyard’s expert horticulturalist, Diane Burns, and guest host flower grower Jenny Hopkins, owner of Big Arms Farm in North Garden. 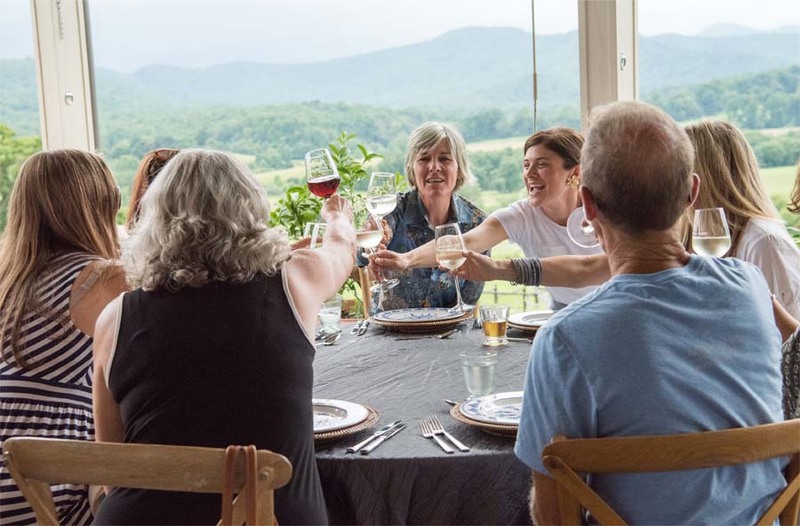 The delightful afternoon included a tour of Pippin Hill’s gardens and grounds, a flower arranging workshop and a farm-to-table, wine-paired lunch on the veranda overlooking the winery’s beautiful mountain views. After the grounds tour, guests settled into the Reserve Room for a flower arranging workshop with Jenny Hopkins. After learning how to prepare stems for bouquets, including advice on creating homemade “flower food,” guests were able to peruse an array of pre-cut seasonal flowers to create their own displays. 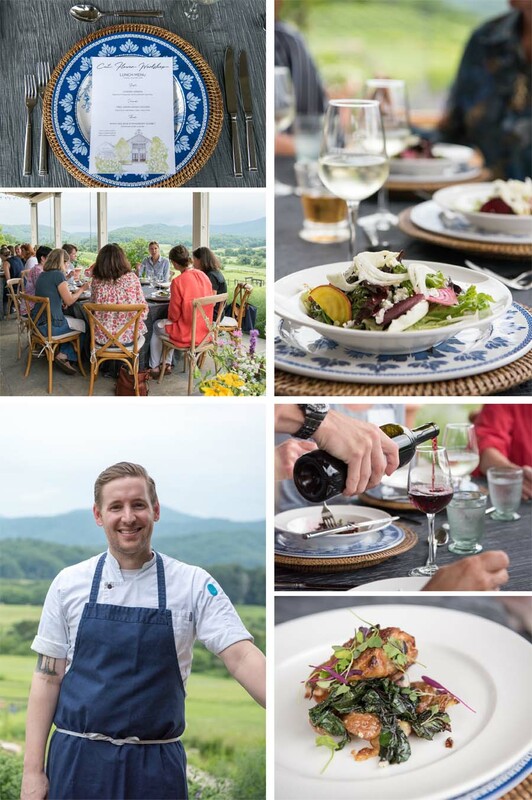 Following the workshop, guests moved outdoors for a farm-to-table luncheon prepared by Executive Chef Ian Rynecki. The three-course meal included fresh garden greens in a nasturtium vinaigrette with radish and feta followed by Free Union Grass chicken with a poached and fried marble potato and swiss chard before concluding with a Mara Des Bois strawberry sorbet with a shortbread cookie and lavender. In addition, Pippin Hill’s Vineyard Manager Brooks Hoover charmed guests with a brief talk, providing insight into the wines guests were enjoying with their lunch. 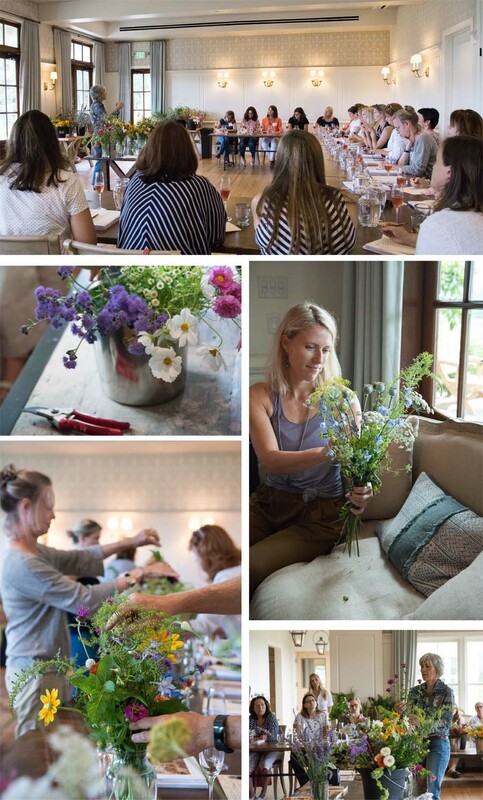 The sold-out event was a great success with attendees not only learning practical flower cutting and arranging tips but also gaining hands-on experience with arranging before dining al fresco with Pippin Hill wines. Check out some flower cutting and arranging tips from the workshop below that you can try yourself! Harvest in the morning when the plants are fully hydrated. Use a “wiggle test” to determine if a flower is ready to be harvested—flowers are ready to be harvested when their stems are firm. Cut stems 1 1/2 to 2 times as tall as the vase you wish to place them in, and cut above leaf nodes so that plants can continue to bloom after cuts. Place freshly cut flowers into a flower food solution immediately after cutting and then in a fridge if possible for further cooling. When harvesting, you can protect your plants from Japanese Beetles by shaking them off from stems into a cup of soapy water. Keep your hand relaxed. When your hand is too warm, it can cause flowers to wilt. Cut flowers at an angle so they can get more water when sitting in the vase. Make sure your arrangement is not near heat or a fan. Change water in your vase every 3 days to help extend the life of your flowers. Going away for a few days? Store your arrangement in the fridge.